We offer a range of Industrial Chemical Centrifuges, which operates through a motor that puts an object in rotation over a fixed axis, by applying a force perpendicular to the axis. 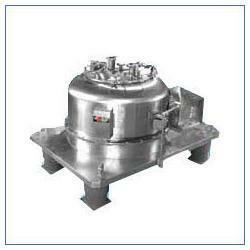 The Industrial Centrifuges works on a principle of sedimentation, where the centripetal acceleration is used for separating substances of higher and lesser density. Our 4 point centrifuges are offered in several sizes as well as types and are used for drying yarns, fabrics, clothes, silk and others, by using centrifugal force. We have acquired a position of great repute in the global industry due to our all-inclusive range of Tanks And Vessels like Pressure Tanks, Pressure Vessels, Industrial Equipment like Bag Filters, Air Receivers, Industrial Centrifuges, Industrial Reactors, Tray Dryers, Ball Mills, Structural Fabrications. Known for their qualitative attributes of durability, superior performance and sturdy construction, our range of process control equipment is extensive used in industries such as chemical, pharmaceutical, textile, engineering, automobile, agricultural and others. We follow stringent quality measures to provide impeccable range of process equipment and ensure that they fulfill the unique requirements of our clients. Further, backed by the ability of our workforce, we offer after sales support to our clients.